The Sword of Saint Maurice (Turin) is one of the best preserved 13th century swords. It is a massive sword, surely intended for use from horseback. From our own experience with our recreation, we have found that it is best weilded with the forefinger over the guard. St. Maurice is believed to have been an officer in a legion of Christian soldiers from Upper Egypt during the reign of Emperor Maximian Herculius, circa 287. His legion, Legio Thebiae (Theban Legion), is believed to have been composed of as many as 6,600 Egyptian Christian Copts who had been originally recruited from and stationed in Thebias in Upper Egypt. Maximian transferred the Theban Legion, among other imperial units, to Gaul in an effort to crush a Gaulish revolt. The entire Theban legion was massacred en masse by their own side when they refused to participate in pagan sacrifices at Aaunum, an area of modern Switzerland. The earliest surviving evidence for St. Maurice consists of a letter written during the early 5th century. It names a late 4th century bishop, Theodore of Octodurum, as the discoverer of the relics of St. Maurice and his companions. The fact that St. Maurice is said to have belonged to a legion called the Thebiae, which was stationed in northern Italy in the early 5th century at the latest, suggests that Theodore invented the story of St. Maurice in order to appeal to this legion for political reasons. One possibility is that he had been trying to persuade the legion not to accept the usurper Eugenius as their new emperor in 392. For additional information about the swords of St. Maurice, see this very informative article by Björn Hellqvist on Björns svärdssida. Unlike the other sword attributed to St. Maurice that resides in Vienna, the Turin St. Maurice was kept together with relics of the saint. The sword was believed to have been the one used to behead St. Maurice, though it is clearly a 13th century sword. Originally in the Treasury of the Abbey of St. Maurice in the Valois (Switzerland), in 1591 Carol Emanuele I of Savoy transferred the sword, together with half the bones of St. Maurice, to the Royal Chapel at Turin. Since 1858, the sword has been displayed in the Armeria Reale (Royal Armory) in Turin and has the inventory number AR G 25. It is in a very fine state of preservation - looking almost as if it was forged yesterday. The sword is believed to have been made in the first half of the 13th century. Unlike its name-sake in Vienna, this is very much a no-frills fighting sword without any embellishments. The iron pommel is a so-called "Brazil nut" pommel of Oakeshott's type A. The grip is made of wood covered with thin, brown leather, parchment or possibly even linen, some of which has dried and peeled away during the centuries. The iron cross is of Oakeshott's style 6, slightly bent-down and with flattened tips. The steel blade is an Oakeshott type XII and has a rather broad (1/3 of the blade width), shallow fuller running about the three quarter's length of the blade. One reason why the sword is in such a fine condition is probably because it was stored in a special leather case. The case is made of finely tooled and decorated dark brown leather and gesso duro (a type of plaster). It was fashioned in the years 1434-38, which is evident from the style of armor worn by the saint painted on the hilt end of the case. Other decorations are the arms of Savoy, Piedmont and Genoa, and an inscription in Latin: O bone mauricii defende tui cor amici ut nunquam subici laqueis possit inimici. "Just by being close to this sword, especially since it is not according to contemporary ideas, makes one develop a deeper understanding for what the medieval sword was all about. This is one end of the spectrum. This is one of those totally dedicated, unabashed and no nonsense swords. It is not about finesse, but totally about when and where to use. It´s effectiveness is not being brought out by tentatively chopping the air. It takes a full swing *against a target* to understand what this one is all about. I have been waiting eagerly to see this one completed. Handling the original was one of my finest moments yet. It made a very strong impression on me, having the original in my hand. This sword is not about [aesthetics]. It is just what it is: no prettyfying, just the brutal basics. And still it is not undignified or unevolved. In its own way it is very well planned out and executed. " The grip has a stabilized wood core, with a triple linen cloth winding, which is in turn covered by leather treated with bees wax. The original scabbard is preserved, which is even more rare. It is a simple affair, made from two wooden slats and covered with vellum (a very fine untanned calfskin). There is a seam down one side, not on the back as is usual in this period. There are remnants of a belt fitting near the scabbard mouth, executed in a style typical of the 13th century. There is a very rudamentary iron chape at the end of the scabbard. In developing this sword for Albion production I had reason to revisit this moment countless times. Many small details have to be considered and evaluated, many impressions have to be critiqued and looked at from new angles. It is a situation where I have my documented data but also the memory of the feel of the sword as well as the impression of its presence. A reconstruction has to be true to all these: the final sword has to follow the numbers but also remain true to a personal image of what the sword would have been when new. With this sword very little has changed over time. It seems to have had a fall or accident at some time as there was a crack across the blade some distance from the point (together with a slight bend). The chape of the scabbard also looked like it had been banged into something. The edges were otherwise well preserved and as good as sharp (you cold probably sharpen a pencil with this sword as it is today). The grip had a cover of textile that was glued down (no stitches) and possibly coated with shellac or just saturated with glue. My first impression was that this was the complete and intact original grip. After careful consideration, I now tend to think the textile was the foundation for another cover of some kind (and I guess that was probably leather although it could also have been textile). A textile wrap that is just glued down with hide glue does not seem to be durable enough by itself. In use the glue would also become sticky from sweat, rubbing and body heat. Rather quickly such a grip would probably come undone. In fact, the textile wrap has begun to lift away from the wooden core of the grip at both ends: it is only in the middle that the textile still attaches securely to the core. This lifting affects the outline of the grip in photos you might have seen. The grip in the reconstruction is given a shape that is to my best understanding of that the original grip must have looked like when everything was tight and nice. We decided to go with a cover of fine leather that is treated with beeswax, but otherwise left with its natural color (the beauty of this is that it will slowly darken even more when subjected to sunlight, developing a nice deep and mellow patina over time). This is to harmonize with the scabbard that is well made, even if quickly put together. Spare pieces were stitched together and left without any treatment, other than possibly some wax or oil for water proofing. The hilt is sturdy and shows a very good fit. Especially the slot in the guard is tightly cut to accommodate for the blade. All surfaces are ever so slightly domed and the edges have a fine rounding, to take away the sharpness without compromising the crispness of the forging. Clearly the work of a skilled craftsman with years of experience and a good eye for shape and proportion. The pommel seems to have had a few extra strikes during the life time of the sword as the top of the pommel is a bit squashed. I chose to carve the waxes as I think they would have looked when the sword was first put together (without this deformation): the pommel is not yet struck out of shape at the top and both arms of the guard still follow the same ark (or very nearly so). One arm of the guard of the original is slightly bent out of true and I think this happened during the working time of the sword, or possible at the same time as when the blade got the small hair line crack. These are, as you understand all my personal impressions. I write about this to show that there is more into a reconstruction apart from merely recording the numbers and go from those. The final goal is to arrive at something that is more than just a faithful duplication of dimensions, but something that is true to the character of the original. This way a reconstruction will always be depending on how you look at the original and what you look for. Not two people will ever document a sword in exactly the same way. You are going to look for different things and appreciate different aspects of it. The engraved letters and symbols in the blade are done with the CNC. Steve and I sat down to make sure the marks are all not "perfect" but just slightly uneven, as they are on the original. They are not geometrically perfect, but shows slight crookedness, as if carved into the blade by someone who cannot spend the whole day doing it: quickly but done with a sure hand. This is the impression I got when seeing them up close. I do not think the lines had silver inlays. I have racked my brain on this detail and looked through the photo many, many times. As far as I can make out , they were cut into the steel, but left as lines. This is what we have worked to reproduce. Steve did a great job in converting my hand drawn signs into a program that cuts the shapes into the fuller with a fine and pointy graving tool. The feel, character and presence of this sword...well, what can I say? To me it is a splendid weapon. I was completely overwhelmed by it. To me this is beyond a question if it has "good balance" or not. This sword is what it is without making any excuses whatsoever. It is big, bold, sturdy and very powerful. It will take a strong arm to wield it efficiently. I guess that is why it was made the way it is. It was forged for someone that was very full grown, perhaps going to the holy land. It is the sword of a knight, who would fight fully clad in mail using a large shield, sitting on a powerful charger. This sword is made to strike fear into the heart of any man who would oppose this knight. Oakeshott writes about these big swords in his "Sword in Hand": a class of weapons of unusual size and mass. Great big swords for single hand use that had to deal with mail, thick shields and very tough opposition. This is one of those (I don't think it is the biggest, but that is beside the point). I do not doubt this is the reason this sword was chosen to represent the sword of the ancient saint. You can tell just by looking at the sword: the man who owned it must have been a powerful and fearsome fighter. It is difficult to describe the feel of this sword. It is massive, yes. It is not one of the "quickest" swords you wil find (quickness in a fight is after all not just about absolute speed but equally important to be in the right place at the right time). I still do not think it is clunky or cumbersome or badly designed by its original maker(or makers). Holding this statically in your hand you might be impressed with the sheer mass of it. Once you start to wield it in earnest it will begin to sing. It is meant for movement and it will move like the big charger of the knight: near unstoppable (this surely is no pony for leisure picnics). The size and mass of the blade helps guiding it through the cut. It will make an impression on targets that are not easily affected by lighter and quicker weapons. It is meant for big deliberate blows, when timing and distance is paramount. One great cut that really will count that is delivered as you pass, sitting in your saddle, or moving on foot behind your great long shield. 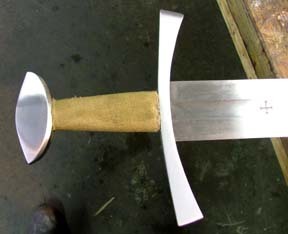 There have been attempts to compare the Saint Maurice to other swords available from both Albion and other makers. I don't think there are many other swords on the market that come close to the character of this one. This is from many reasons. One important reason might be that big swords like this become almost intimidating. You can't appreciate them like other swords who stand out because of lightness, speed and nimbleness. To understand this sword you will have to look from another type of mindset: you have to put yourself in the situation of a mid 13th C warrior who is trained to fight wearing heavy mail and a large shield. A horseman who is taught from childhood the harsh conditions of the fighting knight. To appreciate this sword will be to incorporate a small bit of an age that has passed long by. I think that is part of the beauty of this sword: it is demanding and makes no excuses. This sword that is now offered through Albion is the result of my documentation of the original and my impressions and memories of the moment I got to share together with the awesome original. The tingling feel I got when working with the components tell me the result is indeed pretty close (as close as I could ever hope to get if I were to make a reconstruction myself in my own smithy). It will be very interesting to hear reaction on this sword when it reaches the hands of enthusiasts. I am really looking forward to your feedback." Special thanks to Björn Hellqvist for additional information from his website on this sword.